External access rules allow specific services access to the Smoothwall System. A default rule is provided to grant access to all services across the default interface selected during installation. 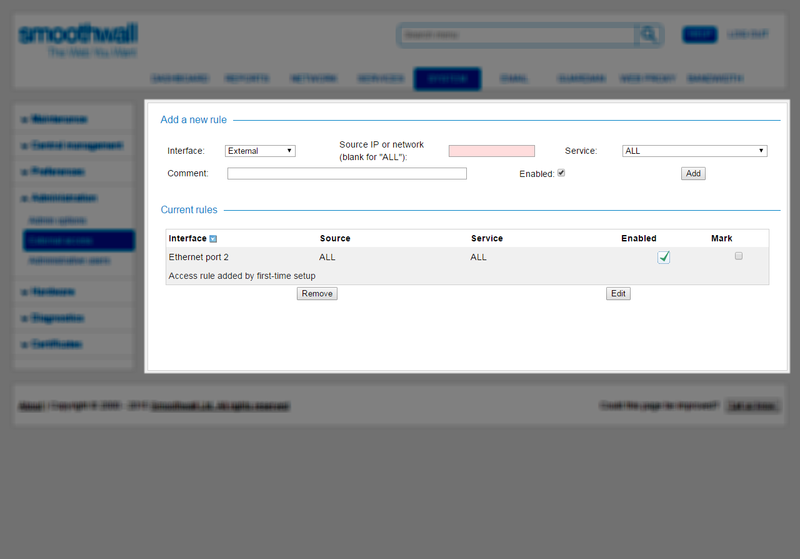 If you have multiple connections configured, you can choose which services have access to an interface. Note: If the Smoothwall System is configured with multiple connections, you must configure an explicit external access rule for some services. These are described separately in the relevant section. Note: Note that a Unified Threat Management serial is required to view the Heartbeat service. For more information, contact your Smoothwall representative. Note: Note that a Unified Threat Management serial is required to view the SIP service. For more information, contact your Smoothwall representative. The number following the service name denotes the port number used. • Interface — From the drop-down list, select the interface that access is permitted from. • Source IP, or network (blank for “ALL”)— Specify individual hosts, ranges of hosts or subnet ranges of hosts that are permitted. For a range of hosts, enter an IP address range, for example, 192.168.10.1-192.168.10.50. For a particular subnet of hosts, enter a subnet range, for example, 192.168.10.0/255.255.255.0 or 192.168.10.0/24. If no value is entered, any source IP can access the system. • Service — Select the permitted access method. For a detailed description of available services, see Configuring External Access Rules. • Enabled — New external access rules are enabled by default. Clear the check box to create a disabled rule. Note: Do not remove the default external access rule, it provides access to the default internal network. 4. Edit the configuration as required. For a detailed description of each setting, see Adding External Access Rules.